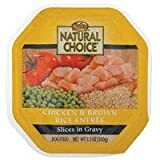 FeaturesType - Natural choice chicken small breed adult dog food tray. Capacity - 3.5 oz. Dimension - 3.75 x 3.5 x 1 in. Item Weight - 0.24 lbs. Chicken & Brown Rice Entrée Slices in Gravy Formulated to provide 100% complete and balanced nutrition for adult maintenance. 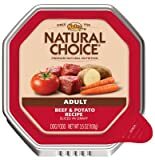 Like all NATURAL CHOICE® products, this product does not use chicken heads, feet or intestines and contains no ground yellow corn. We use highly digestible rice, chicken protein and high levels of linoleic acid for healthy skin and coat. 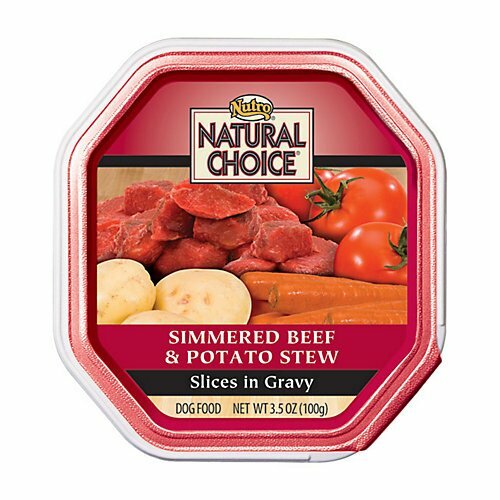 NATURAL CHOICE® Adult formula provides the premium nutrition your dog deserves for a healthy, happy and long life.